I was looking back through my recipes this weekend and realized that I had not shared a crumb cake dessert with you since the beginning of December. Clearly this is a huge oversight on my crumb cake loving part because I sincerely believe in crumb topping all the things! I also strongly believe in chocolate so the two were bound to come together sooner or later. 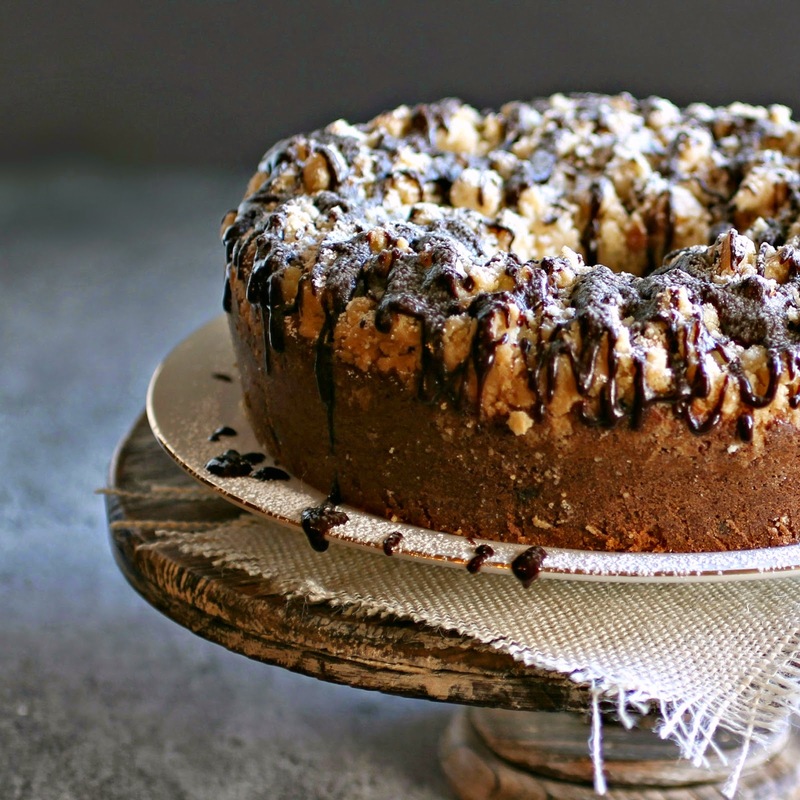 Even though this cake has 3 separate steps, the cake, the crumb and the sauce, all are quite easy to make. You can also certainly skip the extra chocolate sauce although I don't know why anyone would do such a thing. 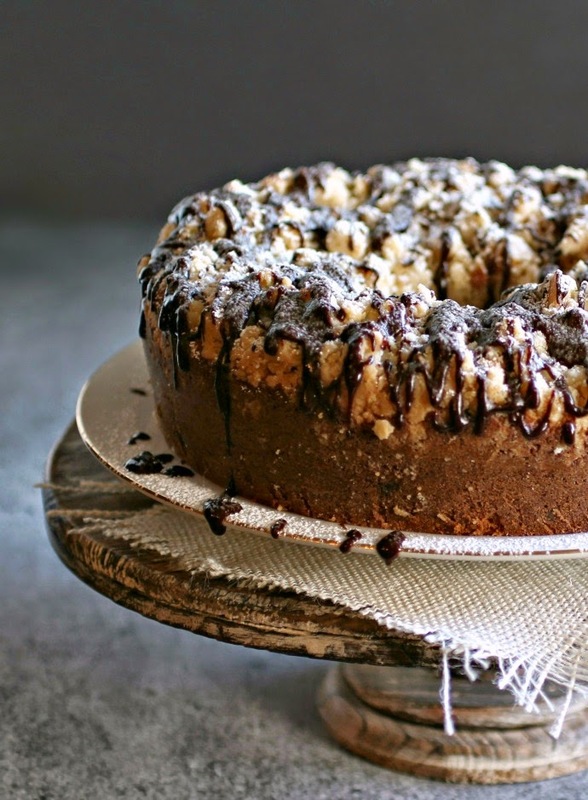 This cake really needs to cool completely before you try to get it out of the pan and while you're waiting you're also going to be seriously tempted to eat the crumbs off the top of the cake. I will caution you to stop doing that just as soon as I stop doing it myself. Enjoy! Pre-heat the oven to 350 degrees and butter and flour a tube style (angel food) pan. In a large bowl, cream together the butter and sugar using a stand or hand mixer. Mix in the eggs, vanilla and sour cream. In a separate bowl, sift together the flour, baking powder, baking soda and salt. Place the chocolate chips in a small bowl and mix with one tablespoon of the flour mixture. This will help the chips to not sink to the bottom of the cake in the oven. Beat the flour mixture into the web batter just until incorporated and then fold in the chocolate chips. Pour into the prepared tube pan. Make the topping by mixing together the sugar, flour, salt and melted butter in a small bowl. When fully incorporated, stick it together with your hands and crumble it over the top of the cake batter. Bake for 50 - 55 minutes or until the crumb is a light golden brown and a toothpick comes out clean. Allow to cool thoroughly before removing from the pan. 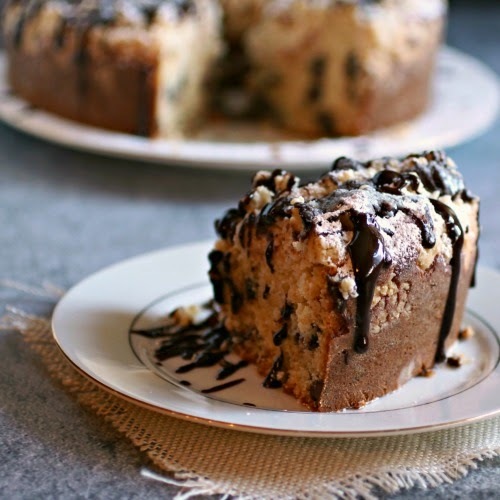 Melt the chocolate chips and butter together over a pot of steaming water or in the microwave and spoon over the cake, if desired. Yeah, no, skipping the extra chocolate sauce does NOT sound like an option in my book! I need to try a crumb cake. I make muffins with streusel topping quite often, and of course, the streusel is the best part. I don't know have a tube pan - do you know if this would work in just a regular rectangle baking dish? I know it won't look as pretty, but it's the taste that matters, right? Makes me want to run to the airport to fly to New York so I can get a slice today. 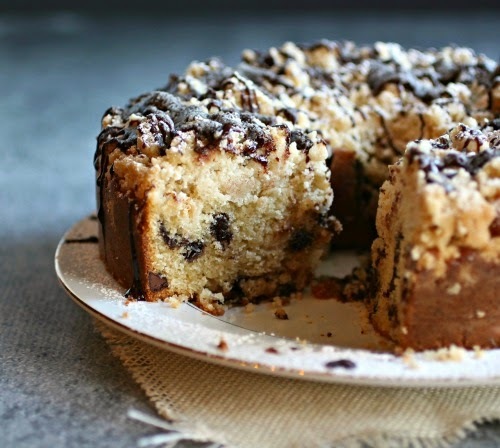 I definitely am craving a slice of this choc chip crumb cake to go alongside my afternoon cup of coffee. Just divine! No crumb cake since December?! Gasp! I'm glad you remedied the situation because this cake looks amazing! So moist 'n fluffy inside, with that thick layer of streusel and that gorgeous glaze. Delicious! Oh my gosh this looks just amazing, Anita!! I attend the church of crumb cake faithfully, especially in summer, but have never had a chocolate chip one. The texture looks beautiful - as do all your photos! Could you cut the recipe in half and bake in an 8 in square pan? I have not tried to do either so I can't say for sure. But my recommendation would be to try baking it in a square or rectangular pan but not to cut the recipe in half. If you do, though, do come back and let me know how it went. how much is 1 stick butter? Hi Corin, although I haven't tried buttermilk or yogurt with this cake, I do believe either one will work fine. Let me know how it turns out!